Autism Reveals Social Roots of Language Like many people with autism, Temple Grandin struggles with language and also with personal relationships. Scientists say that's probably not a coincidence, as research increasingly suggests that language depends as much on social skills as grammar. People with autism often struggle to learn language, and they also struggle with personal relationships. Scientists say that's probably not a coincidence. There's growing evidence that language depends as much on the brain circuits that help us navigate a cocktail party as those that conjugate verbs. One of the people who believes that evidence is Temple Grandin. She teaches animal science at Colorado State University and has written several best-selling books. She's also autistic. Grandin says it has taken her most of her life to reach the point where she can speak with other people in a way that sounds natural. She says that's because she's had to learn language without the social abilities most people have. 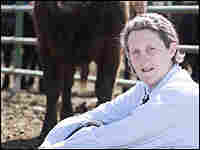 Grandin didn't begin speaking until she was 3 ½ years old. Her first words referred to things, not people, she says. "I'd point at something that I wanted, you know like a piece of candy or whatever, and say, 'there,'" Grandin says. She wasn't using language to reach out to her parents or to other children, the way most kids do, so she didn't have the same motivation to talk. A Tool for Information, or Attention? When Grandin finally did become interested in words, it was because they provided a way to get information, not attention. "When I was in third grade, I had trouble with reading, so mother taught me how to read," she says. It opened up a world full of "so many interesting things," she recalls: "I used to like to get the World Book Encyclopedia and read it." But the encyclopedia taught her little about using language to make friends. Even when she got to high school, chit-chat and gossip meant nothing to her. She says that made her teenage years the worst part of her life. "Kids teased me, called me tape recorder because when I talked it was kind of like just using the same phrases." She also kept talking, without letting other people respond. Grandin and many others with autism have no problem with the mechanics of language, says Dr. V.S. Ramachandran, a neuroscientist at University of California, San Diego. But they don't understand what's really going on in many conversations. "That's one of the hallmarks of autism," he says, "difficulty with social interaction, manifest both in spoken language and in just lack of empathy. The ability to understand other minds would be one way of describing it." Ramachandran says it's hard to use language if you don't have any idea what someone else is thinking and feeling. That may seem obvious. But in the past, researchers have treated language as if it were primarily a system of rules. They assumed that people spoke because every human brain came pre-wired with a "universal grammar." Now, a growing number of researchers, including Ramachandran, argue that the social and emotional aspects of language are at least as important as the rules for stringing words together. Ramachandran says one reason for the new thinking is a new understanding of the human brain. He says it's become clear that babies' brains are programmed to imitate. "You stick your tongue out at a newborn baby, very often the newborn baby will stick its tongue out," he says. Similarly, babies return smiles and often make sounds when someone speaks to them. A few years ago, scientists found a biological explanation for this phenomenon: specialized brain cells called mirror neurons. These neurons fire when you do things such as sticking your tongue out. They also fire when you watch someone else stick their tongue out. And mirror neurons can reflect emotions as well as physical actions. Experiments show that some of the same cells that fire when we feel pain also fire when we see another person in pain. But people with autism appear to have faulty mirror neurons. That may be why they have trouble putting themselves in someone else's shoes. And Ramachandran says without that ability, a lot of what you can accomplish with language disappears. "You have to be aware of the effects that your words are having on the other person's mind," he says. Otherwise, how could we use words to manipulate other people? Temple Grandin has learned to compensate for her difficulty. Early in her career, she spoke to people on the phone instead of face to face. That way she didn't miss messages conveyed through eye contact or body language. But even on the phone, people may not say what they mean. The phrase "I'm fine" sometimes means just the opposite. So Grandin taught herself to listen very closely to a person's tone of voice. "When I had a client that I thought might be angry with me, I'd call him up just so I could listen to his voice," she says. "If it had a certain little whine sound in it I'd go, 'Oh he's still angry with me.'" Over time, Grandin has developed a catalogue of signals she uses to figure out what people are thinking. She checks to see if they are fidgeting during a lecture, or making eye contact during a conversation, or folding their arms during an argument -- emotional cues most of us register automatically. "I always keep learning," Grandin says. "People ask for the single magic breakthrough. There isn't one. I keep learning every day how I think and feel is different. It's all through logic, trial and error, intellect." Intellect can only take her so far, though. Grandin says she still has trouble with certain types of conversations. "Just a couple of years ago I went out to dinner with some salesmen, and these people were absolutely totally social," she says. "They talked for three hours about sports-themed nothing. There was no informational content in what they were talking about. It was a lot of silly jokes about the color of medication and the color of different team mascots. It was boring for me." The salesmen were using language as a way of bonding with one another -- not a way to share information. Scientists say this sort of behavior may explain how humans developed language in the first place. Bonding is something most animals do. For example, apes bond by grooming each other. And one theory has it that early humans began to augment their grooming with affectionate gestures and sounds that eventually led to primitive language. Ramachandran says there are some gaps in that hypothesis. Like how people got from grunts to grammar. "The difficult part is to try to disentangle the notion that emotional empathy merely gives you motivation, a reason to talk to somebody, versus an absolutely critical role in the emergence of language," he says. Ramachandran suspects it's the latter because empathy is what allows people to understand the intention behind an action or a phrase. For example, he says, when we see someone reach for a peanut, empathy helps us decide if they intend to eat it, or throw it at us. 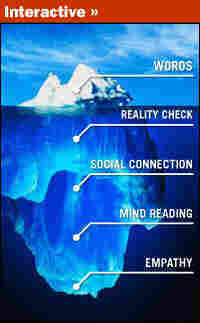 And when we hear someone use a string of words, empathy tells us whether to take the words literally or figuratively. Ramachandran says people who lack empathy also lack the ability to read another person's intentions -- whether physical or linguistic. "Not only do they have problems understanding an action like reaching for a peanut," he says, "but also a metaphor like reaching for the stars." Grandin doesn't use metaphors very often, even though she has mastered the mechanics of language. Grandin says she will never fully understand the social aspects of language, including other people's intentions. And that means language will never offer her more than a rough translation of what other people are trying to say.